EMD GP 38-2 Diesel Locomotive - DCC On Board - CSX #2511 (Dark Future) - HO Scale. DCC ON BOARD locomotives feature dual-mode digital command control decoders enabling operation with a standard DC analog power pack or any NMRA-compliant Digital Command Control system. Speed, direction, and lighting control. KATO N Scale Diesel Locomotive Conrail CR EMD SD80MAC #4100. All-wheel electrical pick-up. Blackened metal wheels. DCC Ready/Friendly for your decoder installation. Lighted preprinted number boards. Directional LED headlights. Equipped with body mounted KATO magnetic knuckle couplers. Low flange wheels. Powerful five-pole KATO motor. Quiet running drives. WISCONSIN CENTRAL With 8-wheel drive. DCC-ready with a factory-installed 8-pin socket for the DCC decoder installation of your choice. Performs best on 18" radius curves or greater. WARNING: CHOKING HAZARD - SMALL PARTS! NOT INTENDED FOR CHILDREN UNDER 3. EMD SD 40-2 Diesel Locomotive - DCC Ready - UNION PACIFIC #3410 - HO Scale. All-wheel drive. DCC-ready with a factory-installed 8-pin plug for DCC decoder installation of your choice. EMD GP 38-2 Diesel Locomotive - DCC On Board - BNSF #2344 - HO Scale. DCC ON BOARD locomotives feature dual-mode digital command control decoders enabling operation with a standard DC analog power pack or any NMRA-compliant Digital Command Control system. Speed, direction, and lighting control. EMD GP7 DCC Sound Value Diesel Locomotive - PRR #8809 - HO Scale. This DCC sound-equipped GP7 includes our Sound Value SoundTraxx diesel sound package with prototypical prime mover, 3 air horns and bell–all in 16-bit polyphonic sound. Features include: DCC-sound equipped, all-wheel drive, can motor, die-cast chassis, E-Z Mate Mark II couplers, Performs best on 18" radius curves or greater. EMD F7-B Diesel Locomotive DCC Equipped - GREAT NORTHERN (green & orange) - N Scale. The "bulldog" is back in an updated model. DCC-equipped for speed, direction and lighting; all new drivetrain; precision motor; die-cast chassis; all-wheel pickup; and E-Z Mate Mark II couplers. EMD GP40 DCC Equipped Locomotive SEABOARD #626 - HO Scale. With these easy to use and affordable locomotives, you can digitally control speed, lighting and direction. Compatible with all NMRA-compliant DCC systems. 8-wheel drive. Works best on 18" radius curves or greater. UNION PACIFIC DCC ON BOARD(tm) locomotives feature dual mode digital command control decoders enabling operation with a standard DC analog power pack or any NMRA-complaint Digital Command Control system. Speed, direction and lighting control. This model also features dual motors per the prototype. Performs best on 22" radius curves or greater. WARNING: CHOKING HAZARD - SMALL PARTS! NOT INTENDED FOR CHILDREN UNDER 3. EMD F7-A Diesel Locomotive DCC Equipped - NORFOLK SOUTHERN (black & gray) - N Scale. The "bulldog" is back in an updated model. DCC-equipped for speed, direction and lighting; all new drivetrain; precision motor; operating LED headlight in A unit; teardrop windows; die-cast chassis; all-wheel pickup; and E-Z Mate Mark II couplers. EMD GP40 DCC Equipped Locomotive CN #4008 - HO Scale. With these easy to use and affordable locomotives, you can digitally control speed, lighting and direction. Compatible with all NMRA-compliant DCC systems. 8-wheel drive. Works best on 18" radius curves or greater. EMD GP38-2 DCC Sound Value Equipped Locomotive - NORFOLK SOUTHERN #5555 (Thoroughbred) - HO Scale. Bachmann is introducing a DCC sound-equipped GP38-2 Diesel that includes our Sound Value SoundTraxx diesel sound package with prototypical prime mover, 3 air horns, and bell—all in polyphonic 16-bit sound. All-wheel drive and E-Z Mate Mark II couplers. Performs best on 18" radius curves or greater. EMD SD40-2 DCC Ready Locomotive - KANSAS CITY SOUTHERN #691 - HO Scale. All-wheel drive. DCC-ready with a factory-installed 8-pin plug for DCC decoder installation of your choice. Performs best on 18" radius curves or greater. EMD DD40 AX Centennial Diesel Locomotive - Sound Value Equipped - UNION PACIFIC #6929 - HO Scale. The largest diesel locomotive ever made is available in a DCC sound-equipped model that includes our Sound Value SoundTraxx diesel sound package with prototypical prime movers (dual-motor sound), 3 air horns, dynamic brakes, and bell–all in 16-bit polyphonic sound. Features include: DCC sound-equipped, dual motors, operating "gumball" light, lighted number boards, E-Z Mate Mark II couplers. 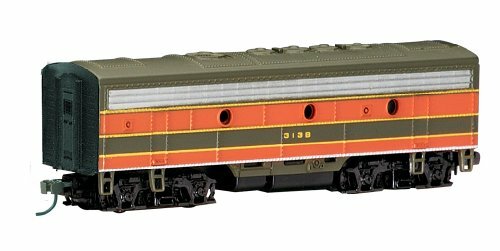 EMD SD45 DCC Sound Equipped Diesel Locomotive - RIO GRANDE™ #5336 (large Flying Grande) - N Scale. This DCC sound-equipped EMD SD45 Diesel includes our Sound Value SoundTraxx® diesel sound package with prototypical prime mover, 3 air horns, and bell—all in polyphonic 16-bit sound. The “special duty” SD45, a 3600-HP prime mover with a V-20 engine and six-axle trucks for superior tractive effort, embodied the latest and greatest technological advances of its day. Following EMD’s lead in the pursuit of cutting-edge technology, we’re proud to offer this N scale sound-equipped locomotive. EMD GP38-2 DCC Sound Value Equipped Locomotive - CSX #2640 - HO Scale. Bachmann is introducing a DCC sound-equipped GP38-2 Diesel that includes our Sound Value SoundTraxx diesel sound package with prototypical prime mover, 3 air horns, and bell—all in polyphonic 16-bit sound. All-wheel drive and E-Z Mate Mark II couplers. Performs best on 18" radius curves or greater. 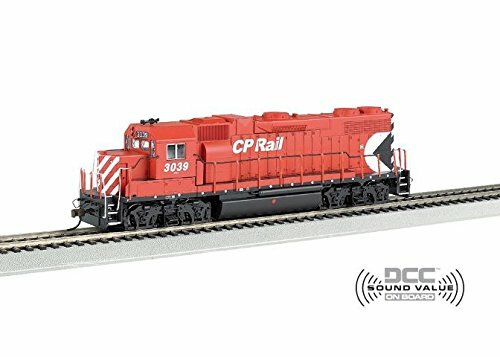 EMD GP38-2 DCC Sound Value Equipped Locomotive - CANADIAN PACIFIC #3039 - HO Scale. Bachmann is introducing a DCC sound-equipped GP38-2 Diesel that includes our Sound Value SoundTraxx diesel sound package with prototypical prime mover, 3 air horns, and bell—all in polyphonic 16-bit sound. All-wheel drive and E-Z Mate Mark II couplers. Performs best on 18" radius curves or greater. Compare prices on Emd Diesel Locomotives at LiveSaler.com – use promo codes and coupons for best offers and deals. We work hard to get you amazing deals and collect all avail hot offers online and represent it in one place for the customers. Now our visitors can leverage benefits of big brands and heavy discounts available for that day and for famous brands. We try to makes comparison shopping easy with Product Reviews, Merchant Ratings, Deal Alerts & Coupons. Find Deals, Compare Prices, Read Reviews & Save Money.